I just got the Ultimaker 3 Extended set up a week before the holidays but I completed two prints before the break. I was approved via capital equipment request to purchase a 3D printer this year for the fab space. I haven’t yet bought it because we’ve been using a Makerbot loaned to us for a year by one of our faculty. It was great to get to use the Makerbot since I’d never done any 3D printing before. 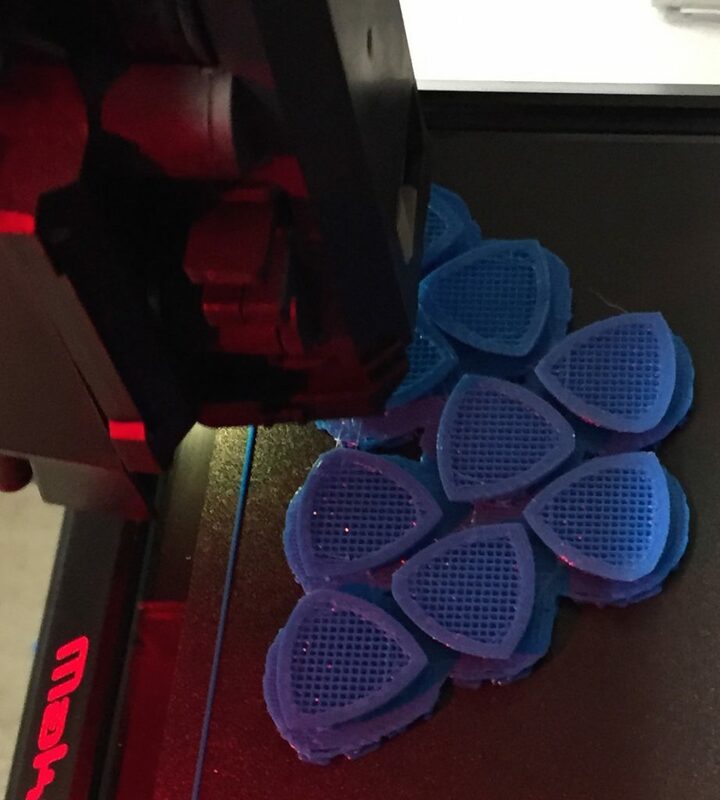 I feel like I have a much better sense of our needs now and am more comfortable choosing the right printer for our applications. This printer was just released earlier this week and looks like it is the one I’ll get. 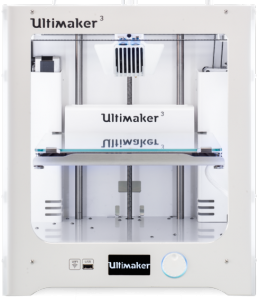 Ultimaker has long been known as a reliable, consistent performer in the high-end consumer grade printer market. Their new release appears to be targeted even more toward professional use. 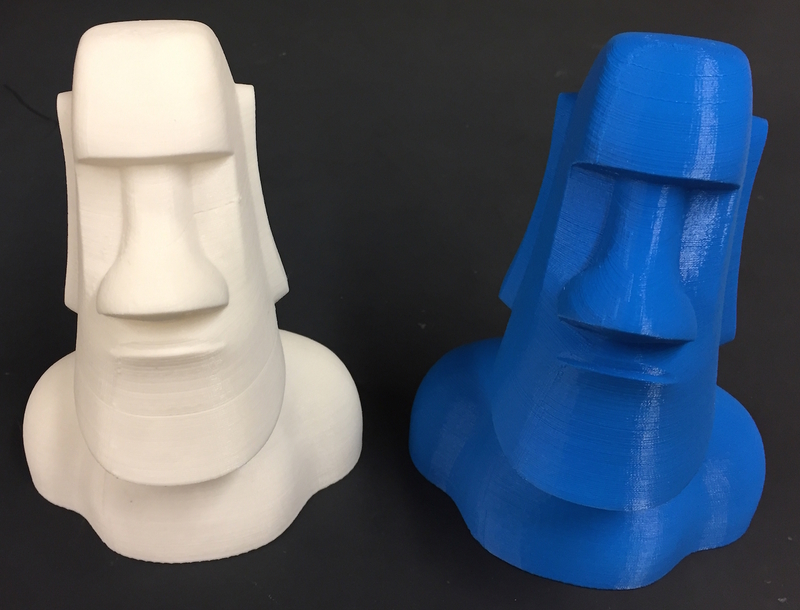 It includes some cool new features (like dual extrusion) which, when paired with the reliability of their printers, makes it a great machine for school use. It’s not the highest tech machine out there but it’s a good performer with a lot of usable features. Unless something new appears in the next month or so we should have one here before the end of the term. After a long hiatus in blog writing we’re back. This year I plan on getting more information online about what type of equipment is available for use and how one might get started using it. 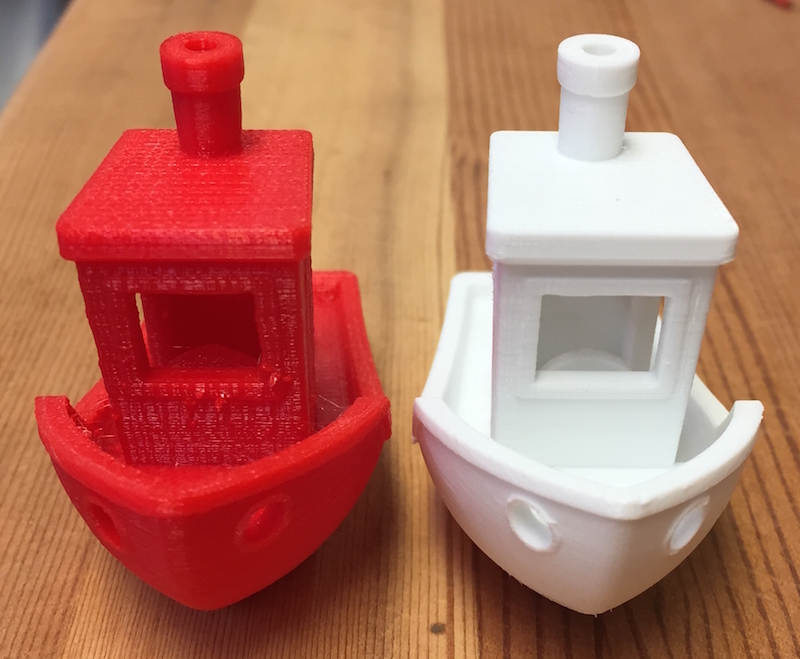 Recently we acquired a Makerbot Replicator 5th Generation 3D printer from a faculty member who is on sabbatical. We’re babysitting his printer while he’s away and he’s generously allowed us to put it to work. 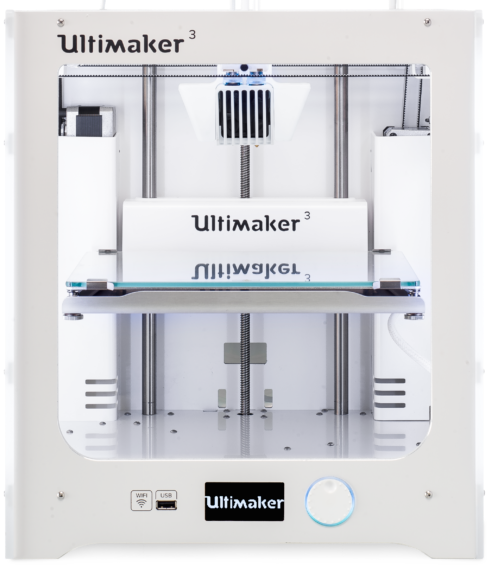 In addition we’ll soon be getting an older Makerbot Replicator Dual Extrusion 3D printer from the Art department. Once it’s all set up both Makerbots will be available for use. More posts to follow, check back soon! This report by the New Media Consortium highlights maker spaces as a Technology to Watch with a widespread adoption time of two to three years. The report doesn’t go into great detail about how the maker spaces would play out, especially in a liberal arts college environment, but still stands as an additional support for more hands-on creative spaces in college and the value it brings to students and graduates. I’m not sure we can truly call ourselves a Fab Lab or Maker Space yet but with an awesome laser cutter along with a networked Solidworks license we’re well on our way. Eric and I ran 4 laser cutter classes during Paideia week and had good turnout each day of 6-10 people. I think that our 10AM start time might have been a factor in preventing us from being overwhelmed with students, but after trying to run 10 student projects through the laser in 2 hours maybe that’s a good thing. The classes were a lot of fun with one of us giving a short intro to the laser and demonstrating a couple pieces before cutting the students loose to try their hand at the process. 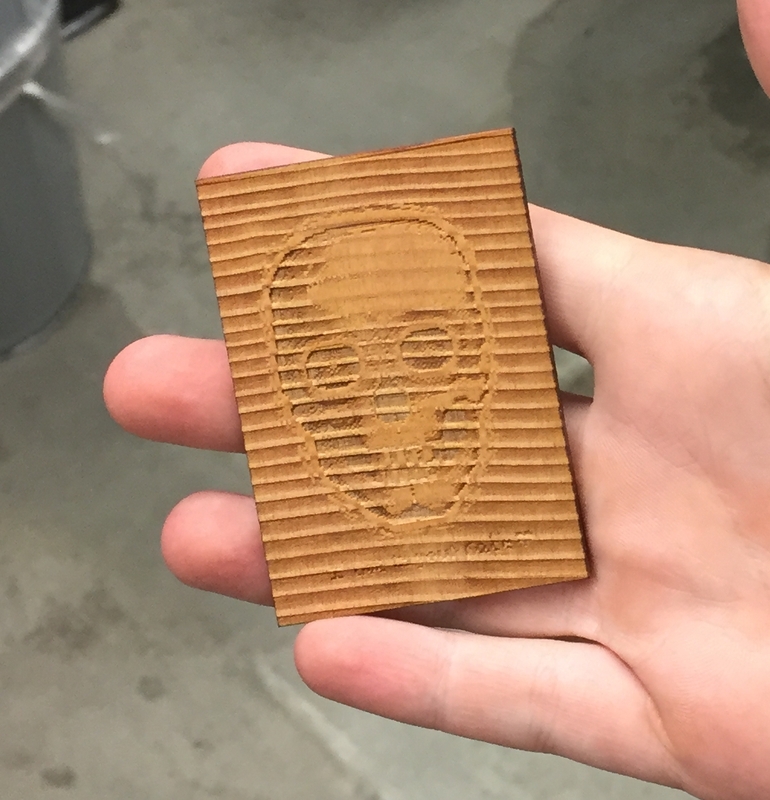 We were able to walk each student through a project of their own and everyone left with a little laser-made part. 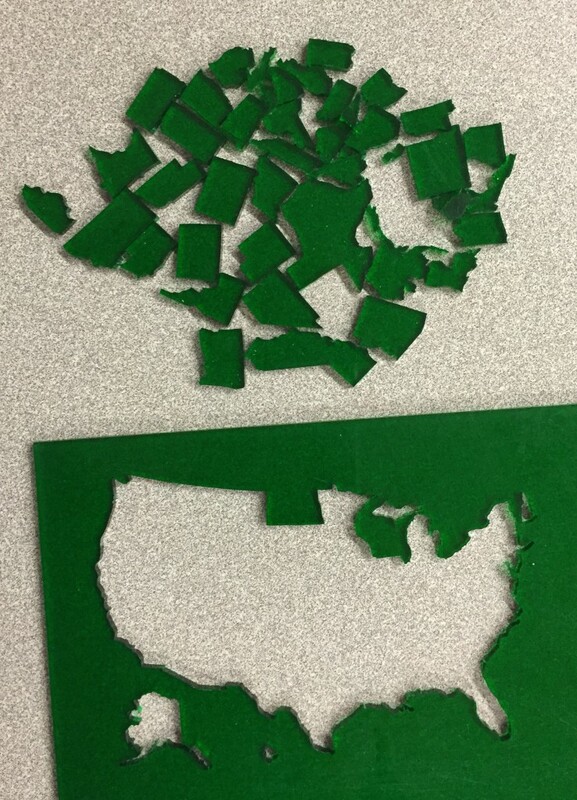 Below are some of the things that students made during their run on the laser. Since the class a few people have come back to use the laser again and we hope to see more later on this term. Engraving on thin doug fir wood. The laser preferentially cut away the material between the growth rings leaving a dynamic background to the engraved image.